Kenneth Branagh is the face of Henry V for me. As I was reading this book and picturing Henry striding through his life, I was seeing Branagh. The 1989 movie was the first Shakespearean play I saw on the Big Screen in a movie theater. Seeing the play so vividly depicted sparked an interest in Shakespeare’s plays that has never waned for me. When others think of Henry V, they might think of Sir Laurence Olivier, who played Henry in the 1944 version. Hollywood doesn’t make movies of Henry’s life; they make movies of William Shakespeare’s play. In comparison to most kings, Henry was a rock star. He first showed his mettle fighting against the Welsh during the Owain Glyndŵr revolt, which gave him the confidence to stand up to his father, who had been suffering from ill health for some time. In 1413, his father died, and Henry was chomping at the bit to be in charge. He was inspiring to his men. He was a natural tactician. He was highly organized, which was a trait that served him well campaigning in France where he was outnumbered, outgunned, and fighting men who were defending and preserving their country. Henry quickly rolled up some victories that gave him confidence to continue. Henry’s goal: add the throne of France to that of England. He was not the first English king to claim the throne of France, but he was the first one who did not take the settlement of lands in exchange for renouncing his claim. He believed that he was going to be king of France, and maybe if he had lived longer, he could very well have pulled it off. 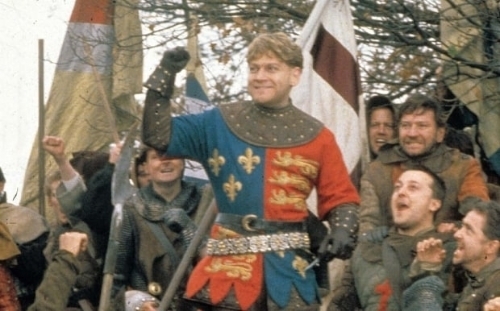 Kenneth Branagh giving the St. Crispin’s Day speech in the 1989 movie. His big moment came at the Battle of Agincourt. I’m sure he gave a great rousing speech for his men, but it is doubtful that he had one as rousing or as memorable as the one Shakespeare writes for him in the play. Depending on which historian you believe, Henry was outnumbered either 4:3 or 6:1 or somewhere in between, but all historians agree that he was indeed outnumbered. His men were tired and had been dreaming for weeks of going home. They certainly were not in the best shape to fight a battle against fresh French troops. The English had a few things on their side. A young, healthy, inspiring King. In contrast, the French King Charles VI was not even at the battle due to a psychotic illness that frequently debilitated his mental proficiency. 80% of their army were the fabled English Longbow archers. Their king situated them so that the French had to cross an open, freshly plowed field that had been rained on heavily the night before. The French sunk to their knees in the muck. It was frankly a slaughter. Approximately 9 Frenchmen died for every Englishman killed. 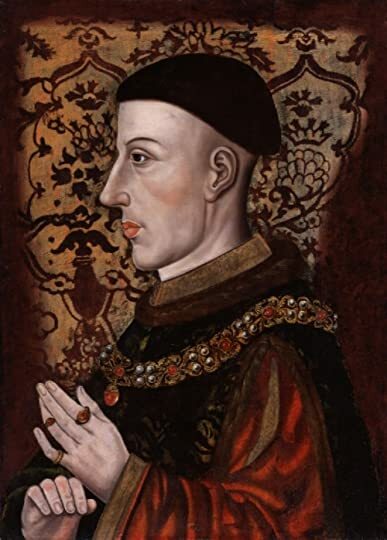 Thousands were captured, and this led to the one black mark that resides on the otherwise sterling record of Henry V.
He ordered the prisoners executed. It was shockingly unchivalrous. He was preparing for a French counter attack, and his fear was that, if the tide of the battle turned against him, those French prisoners would join their compadres. Henry could only spare a handful of men to contain the prisoners, and they would be easily overwhelmed by the sheer number of prisoners. The other problem, of course, was how to go about executing thousands of prisoners in a short period of time. Fortunately, only a few prisoners were executed before Henry reversed his command. He must have felt confident that victory was his. Still it showed a ruthlessness previously unrevealed. Henry’s ambition knew no limits. He had high ideals for himself as well, not only in war, but also in the management of his kingdom. He wanted to be a good steward in addition to being a conquering hero. 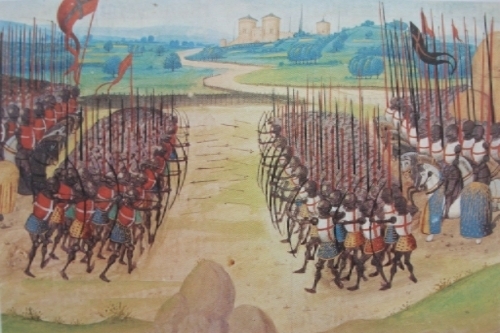 Agincourt fulfilled the expectations that he had for himself and confirmed for his subjects that their king was worthy of shedding blood for, besides providing him with the funds he needed to continue his quest for the French throne. 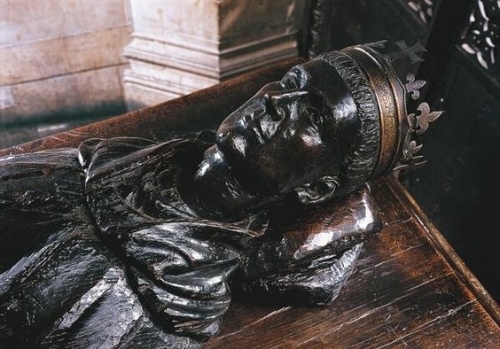 Henry V effigy at Westminster. Henry V died on page 182 with 261 pages remaining in the biography. Unless you are George R. R. Martin, this is a bit of a pickle to find yourself in, losing your main character before you are even half way through the book, but Christopher Allmand made the decision to separate out major topics, like the Army and Navy, Papal Relations, Family Circle, Parliament, and Finances, to name a few. Most biographers would have chosen to weave those elements into the plot surrounding the life of the main subject. The reader could choose to abandon the book after 182 pages, but they would be foregoing a plethora of information about the structure of medieval England in the early 1400s. For me, it was a lot of bonus material that added to my understanding of a time period I’m woefully ignorant about. I still struggle to separate the King Henry V in real life from the King Henry V who Shakespeare created. Certainly, Shakespeare captured the essence of the man. The grand promise of a king who, if he had lived longer than 36 years, quite possibly could have permanently changed the configurations of Europe. As it was, dying so young, he left his nation vulnerable, with only a baby in swaddling clothes to take his place. If he had lived, the Wars of the Roses, in which his son became such a pawn in the struggle for power, may never have happened. With his success on the battlefield in France, he did achieve a wife, Catherine of Valois, daughter of the French king, and a treaty naming him heir to King Charles VI of France. Henry inspired loyalty because he had very tangible goals and a natural ability to make everyone believe that it was impossible for him to lose.